Let’s hear it for the freshmen! You know, the ones who wear lanyards like it’s their job, single-handedly keep the map industry afloat, and show up to class reeking of alcohol and regret. And, of course, the ones who are dominating college basketball. With March Madness fast approaching, it’s time to start getting serious about your bracketology preparation, so here’s a rundown of how this year’s best rookies are faring. It’s virtually impossible for the nation’s top recruit to meet expectations each season, let alone exceed them. Andrew Wiggins had a shaky and underwhelming year at Kansas after being hailed as the next LeBron. Shabazz Muhammad saw his UCLA career riddled with petty NCAA violations and ghastly defensive numbers. Austin Rivers hit that one buzzer-beater against North Carolina but failed to do much else. Most kids today don’t even know who Josh Selby is, which is probably for the best. And then there’s Okafor, who is second nationally in field goal percentage and tied for second in player efficiency rating, and who has led the Blue Devils to a 17-2 record and no. 5 ranking. He bested vaunted Wisconsin big man and Wooden Award front-runner Frank Kaminsky in their head-to-head meeting last month, and he boasts the most refined offensive game of any freshman center in recent memory. Sam Hinkie and Phil Jackson are currently engaging in an unabashed tank-off for Okafor’s services. Oh, and did I mention he can pass? Duke is back to being that hotness right now, having rebounded nicely from an embarrassing pair of consecutive early-January losses to NC State and Miami that briefly seemed to augur yet another collapse. If this season has taught us anything, though, it’s that we should never doubt Coach K’s ability to make crucial adjustments. Between Okafor and stud freshman point guard Tyus Jones, the 1,000-Win Man‘s implementation of the one-and-done Calipari system has been a rousing success. Perhaps “VP” would be more accurate, since Towns is basically Willie Cauley-Stein’s running mate on and off the court. Regardless, Towns has consistently flashed the talent that made him a five-star prospect: Just search “Karl-Anthony Towns dunk” or “Karl-Anthony Towns block” on YouTube for a seemingly endless buffet of upside-exhibiting highlights. The really scary part, though, is that Towns has yet to fully come into his own. Imagine how much more invincible the Wildcats will look when he does — which he almost certainly will. That his name is ready-made for political office is icing on the cake. College basketball coaches must not spend much time in Europe. How else to explain the relative lack of scholarships offered to the 7-foot Poeltl, a native of Vienna? Poeltl spent his childhood playing hoops in extreme obscurity and was enormously lucky to make it onto Utah assistant Andy Hill’s radar. Johnson, a high-flying forward who can score and rebound in equal measure, is unsurprisingly considered by many to be Aaron Gordon’s natural successor. Johnson may not share Gordon’s prodigious length, but he more than makes up for that by hitting his foul shots, which the notoriously free-throw-averse Gordon rarely managed. 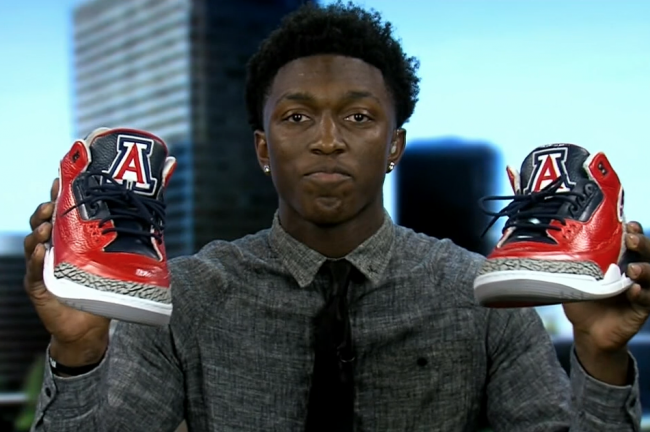 He also boasts some of Gordon’s trademark flare: Johnson announced his decision to attend Arizona by holding up a pair of Wildcats-themed sneakers, which is such a boss move. Maybe Johnson will create future legacy students of his own: We need more STANLEYS in this world, so let’s hope that Johnson’s newfound fame leads to a naming renaissance. Whether the Bruins win or lose, it’s pretty much a lock that Looney is going to finish with a double-double. He’ll occasionally play out of his mind or deliver a total dud, but for the most part he’s been a paragon of unspectacularly consistent excellence. Don’t blame UCLA’s inevitable early-round postseason exit on him. Russell is the least freshman-y freshman. He may be the future, but he’s also the present. Say a prayer for Lourawls “Tum Tum” Nairn’s ankles before you go to bed tonight. Lord knows they need it. You need only inspect Oubre’s game log for a second to see how vastly he’s improved over the course of the season. Dude could barely get on the court in November against such powerhouses as UC Santa Barbara and Rhode Island; now he’s a key cog in the Jayhawks’ starting lineup and has notched double-figure points in seven of his last 10 outings. If he continues to progress at this rate, he’ll have secured the Wooden Award by February, locked up the top spot on most draft boards by March, and received the 2016 GOP presidential nomination by April. With each passing day, Mudiay is looking more and more like the next Jeremy Tyler, which should give you a decent sense of how his overseas experiment has gone so far. (To put it bluntly: not swimmingly.) He injured his ankle back in December and hasn’t played since, and in spite of his absence, the Tigers have won 24 games in a row — they’re basically the post–Josh Smith Pistons of the Chinese Basketball Association. While the former SMU commit’s draft stock somehow remains unsullied for now, the lesson is clear: Take the opportunity to play for Larry Brown when you can, kids.